BlueFire Fastpitch is excited to announce its graduating class (2018) and their college commitments. These seniors have played softball for several years together and continue the great tradition of academic excellence combined with athletic capability; the true essence of a student athlete. They have followed in the foot-steps of past BlueFire graduates and aim to continue to inspire our youth and continue their college softball careers. This class of girls consists of a young talented pool of female student athletes who have learned valuable lessons in development, team building, commitment, dedication and goal setting. Some have decided to continue their softball career in college and some have decided to concentrate on their academics. In either event, we are so proud of their accomplishments and wish them the best in their future endeavors. Hannah will play softball for York College Spartans and major in forensic science. Kara will play softball for Lesley University and major in pre-law studies. 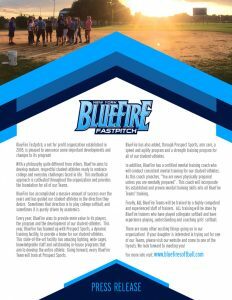 BlueFire Fastpitch, a not for profit organization established in 2005, is pleased to announce some important developments and changes to its program! With a philosophy quite different from others, BlueFire aims to develop mature, respectful student-athletes ready to embrace college and everyday challenges faced in life. This methodical approach is cultivated throughout the organization and provides the foundation for all of our Teams. BlueFire has accomplished a massive amount of success over the years and has guided our student-athletes in the direction they desire. Sometimes that direction is to play college softball, and sometimes it is purely driven by academics. Every year, BlueFire aims to provide more value to its players, the program and the development of our student-athletes. This year, BlueFire has teamed up with Prospect Sports, a dynamic training facility, to provide a home for our student-athletes. This state-of-the-art facility has amazing lighting, wide cages, knowledgeable staff and outstanding in-house programs that aim to develop the entire athlete. Going forward, every BlueFire Team will train at Prospect Sports. BlueFire has also added, through Prospect Sports, arm care, a speed and agility program and a strength training program for all of our student-athletes. In addition, BlueFire has a certified mental training coach who will conduct consistent mental training for our student-athletes. As this coach preaches, “You are never physically prepared unless you are mentally prepared”. This coach will incorporate his established and proven mental training skills into all BlueFire Teams’ training. Finally, ALL BlueFire Teams will be trained by a highly competent and experienced staff of trainers. 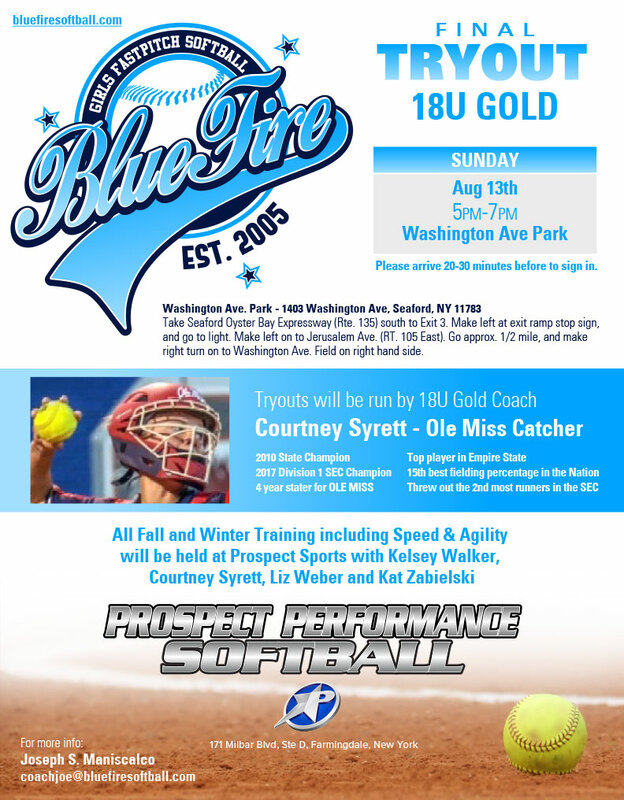 ALL training will be done by BlueFire trainers who have played collegiate softball and have experience playing, understanding and coaching girls’ softball. There are many other exciting things going on in our organization! If your daughter is interested in trying out for one of our Teams, please visit our website and come to one of the tryouts. We look forward to meeting you! BlueFire Fastpitch is excited to announce its graduating class (2017) and their college commitments. These seniors have played softball for several years together and continue the great tradition of academic excellence combined with athletic capability; the true essence of a student athlete. They have followed in the foot-steps of past BlueFire graduates and aim to continue to inspire our youth and continue their college softball careers. Kaitlin will play softball for nationally ranked Ithaca College Bombers and major in broadcast journalism. Stephanie will play softball at Drew University and major in business and political science with aspirations on attending law school. Jordan will play softball at Queens College and major in education with aspirations of being a school teacher and coaching softball one day. Julia will attend Binghamton University School of Management. She was also awarded Student Athlete of the Month for May, 2017 at Mepham High School. BlueFire Girls Softball recently competed in the Annual Toys for Tots program at Baldwin Park and Newbridge Park. This program was born out of a vision by Danny Gomez, a new BlueFire coach, nine years ago. Each year, Danny and his wife Maribel work tirelessly on this tournament which raises toys for tots through the Marine Corp. Each player in the tournament is asked to bring one unwrapped toy and the Marines come to the field, take pictures with the girls and collect the toys. The Marines then distribute those toys to children who are not fortunate enough to have the pleasures we all have. 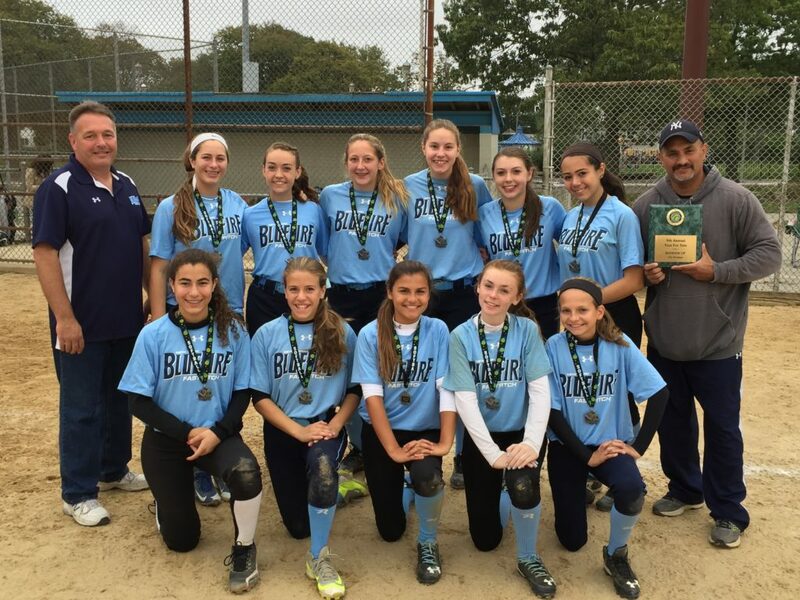 “Anytime that we see a tournament for a great cause, our organization will undoubtedly participate,” explains Joe Maniscalco, Founder and President of the BlueFire Softball Program. We aim to teach softball, but also an appreciation for what we have. We want the girls to recognize the privileges they enjoy and be grateful for them. The Toys for Tots Program was a huge success. Through the program, the tournament was able to fill 12 huge boxes of toys. BlueFire would like to Thank the Marines and Danny Gomez and his wife Maribel for their hard work in running this program. The BlueFire organization is proud to announce the college commitments of its most recent graduating class in June, 2016. 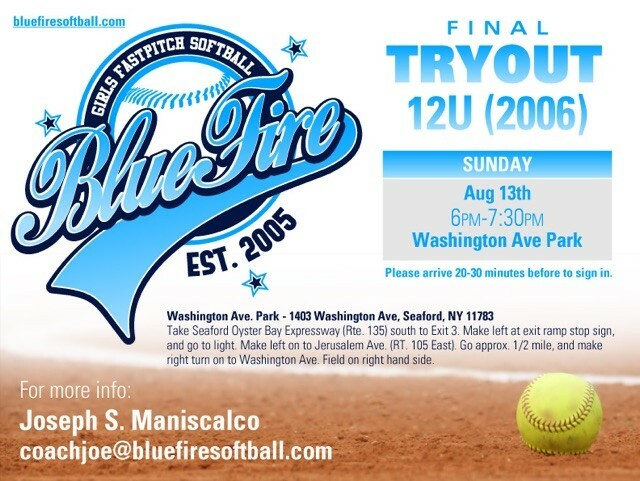 Last August, BlueFire was fortunate to have Glenn Greeley and his wife Fran join the organization and present an all Senior Showcase team with the main goal of assisting, educating and finding those girls a place to play college softball. That goal was accomplished for nine (9) BlueFire girls who will go on to play college softball, or who have been invited for a tryout throughout the United States. “The list of college these girls will be playing and attending is diverse and spreads across the country”, explains President Joseph Maniscalco proudly. “Greeley put a plan of action in place and has been a phenomenal and instrumental part of our organization. I only wish he came to us years earlier. He is a great coach, mentor and guide for these young ladies”. Greeley’s plan actually does not end when the girls going off to college. This past summer, BlueFire had a 23U College team coached by Greeley, where 2015 BlueFire graduates played. He continues to guide these girls and is actually working with some girls who are looking to transfer colleges because they were unhappy with their original selection. One of the BlueFire girls, Kacie Badolato, a graduate of Kellenberg Memorial High School, who will attend Catholic University and play softball, has played for BlueFire since she was 12 years old. “Kacie always wanted to play on the best team against the best competition and it has really paid off for her; the game has slowed down to a point where she has emerged as a current leader and MVP on our 18U Gold team”, explains Maniscalco. I look forward to Kacie having a bright future at Catholic University and beyond. Our organization stresses the importance of academics and being a student athlete over softball. This graduating class has gone above and beyond in balancing those two critical components. The academic scholarships they received are way in excess of the national average of athletic money provided by colleges across the country. We are proud of the mature respectful athletes they have become and wish them the best of luck in the next phase of their softball career. BlueFire Fastpitch is excited to announce its graduating class (2016) and their college commitments. These student athletes have far exceeded our expectations and are disbursed throughout the United States. They will attend college in the fall and continue their softball journey. We are proud of the mature, respectful student athletes they have become and wish them the best in their future. Will play softball at Catholic University and concentrate on biology. Will play softball at University of California at Santa Barbara and concentrate her studies in broadcast communications. Will play softball at Jacksonville University in Florida while majoring in biology. Will play softball at Roger Williams College in Rhode Island. Will attend Seton Hall University and study psychology. She has been invited to tryout for the softball team. Will attend Pace University and study broadcasting. She has been invited to tryout for the softball team. Will attend SUNY Geneseo. She has been invited to tryout for the softball team. Will attend SUNY Geneseo and concentrate her studies in pre-early childhood education with a concentration in math. She has been invited to tryout for the softball team. Will attend NY Institute of Technology and study nursing. She will tryout for the softball team. 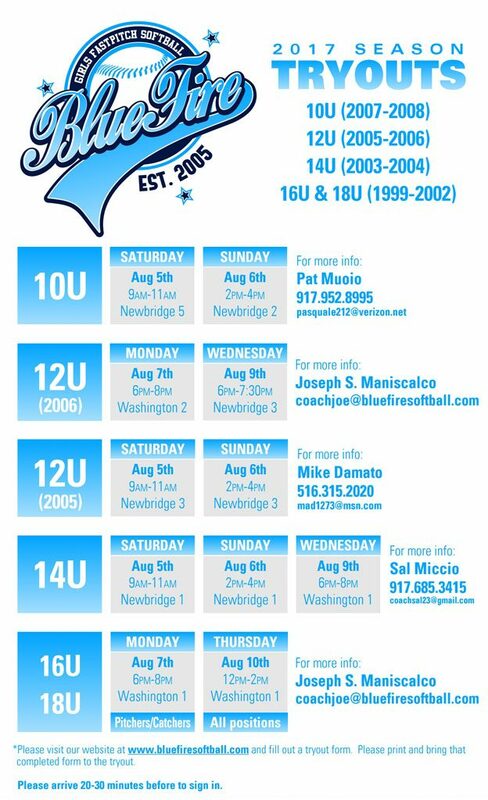 NY BlueFire Softball is seeking dedicated high school senior student athletes. With 10 years experience building our organization, we have forged a reputation of excellence and success at the college circuit. Recently, we hired a Director of Player Development to assist and guide players through the college recruiting process. She has played and coached at the collegiate level and has a vast amount of experience, knowledge and connectivity. Our philosophy is different than most. While we respect all travel organizations, the way an athlete succeeds on and off the field is by playing the game they love. Instead of carrying an extensive roster of girls with limited playing time, we seek athletic female athletes who can excel playing all weekend long. This year we introduce our All Senior team. We are seeking Seniors for this team who will be showcased this fall to the colleges. We will train, develop and assist these girls in their athletic development. The team will be coached by Glenn Greeley, who has extensive experience in college showcases. Our goal is simple: Maintain a small roster for this team, keep the cost as low as possible for the parents, and assist these girls with their goal of playing softball in college. Our organization uses all of the revenue and proceeds it collects through all sources for the benefit of the athletes and nothing else. To wrap this all up, BlueFire has been successful in obtaining large corporate sponsors to assist in its development and program. The cost for the team will be less than $500.00. We believe in putting revenue and sponsor money into the organization, and providing assistance to players and scholarships when available.